At the time of our BWTA, Hannah was in the midst of specialized diet experiment intended to target her migraines. She very gamely observed as I inhaled roughly 2,500 calories of Chinese food, commenting that it was nice, even, to get to watch someone eating stuff she couldn’t eat at the moment. April 1 will be the ten year anniversary of me quitting smoking, so I know what she means – sometimes I still enjoy it when smokers are around me (sometimes not). Hannah is a relatively recent transplant to the area, after spending much of life born, raised, and making art in Boston. She’s still figuring out how and where to fit in to a new city, and how to connect with Detroit while based in Ann Arbor. Before I met her in person, I blind-picked a couple of works in her Stand-In series as part of the 2018 Snowden Exhibition. 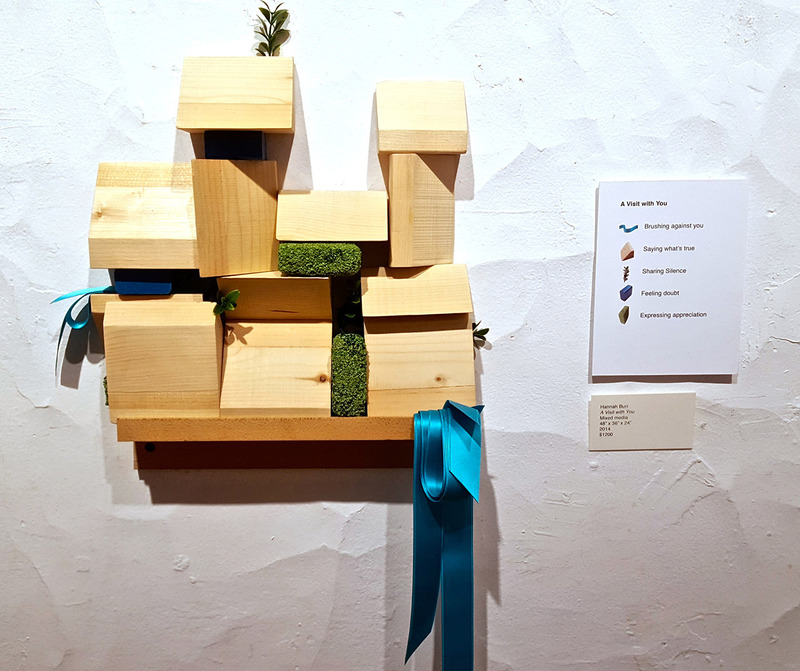 In these works, Hannah assembles sets of objects into arrangements on shelves, then accompanies them with a legend that identifies these shapes and materials (wood blocks, ribbons, sections of astroturf) as abstractions of actions, feelings, or points of interpersonal connection (labored breaths, sharing silence, brushing against you). These are subsets of a larger project, You Are Legend, which expands this practice into environmental observations. Like Hannah herself, these works are open and sincere, unimposing, but also very present. One of Hannah’s works in at the Scarab Club – show runs through March 31! It took until almost the end of the meal for Hannah to start to waxing existential. Up to that point, it was the usual sort of first-meeting fumble for common ground or points of connection. Hannah is an easy conversationalist, able to pick up threads of interest and follow them in almost any direction. It turns out that she has a longstanding meditation practice, and through one of her meditation retreats, she met the person she would go on to marry. 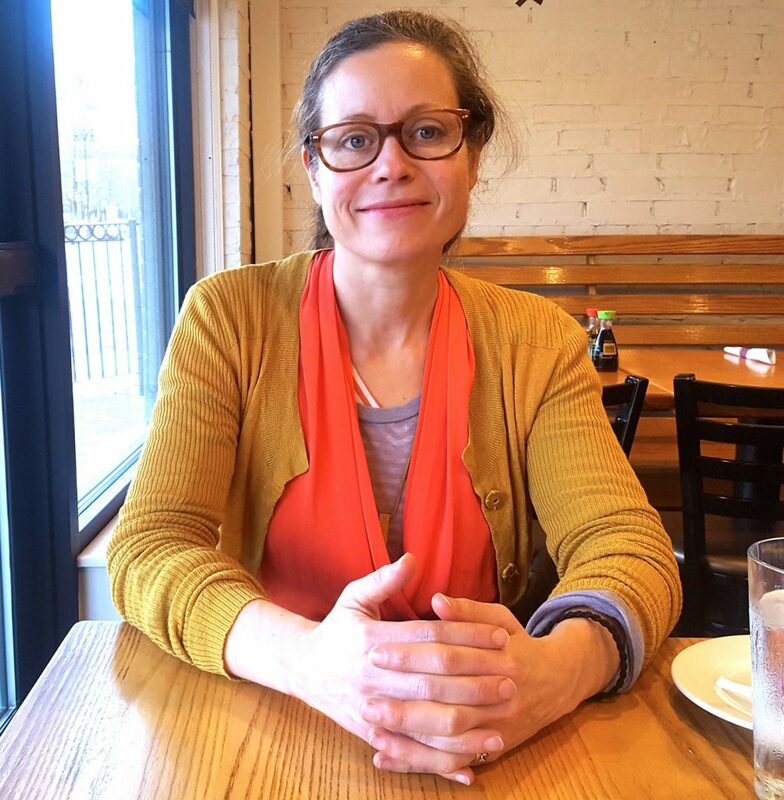 This is the relationship that brought her to the Detroit area, and it’s clear that Hannah considers it a formative experience and opportunity to learn new things. People who like to learn new things are fascinating. Whether it is adopting an almost 100% protein diet, or getting married way after she’d considered that single status was a forgone conclusion, Hannah seems to embrace change with equanimity. The best thing she said – and I’m kicking myself for not recording us – had to do with perceiving oneself as a window. According to Hannah, most people think of themselves as moving through time and situations, but in fact, they are moving through us. We are like a window, looking out through our faces at whatever is passing by our window. “I don’t know that I have a face!” says Hannah, excited and utterly delighted by this notion. “I can only see your face! All the information I have about my face is coming from your face!” She says that she and her husband initially connected on the idea that they don’t even have faces. It’s such a relief, really. I worry a lot about not wearing make-up, but obviously that doesn’t matter at all, if I don’t have a face. Really, talking to Hannah leaves one with the feeling that any kind of nagging worry is best set aside. There is a lot going on that is more interesting to pay attention to than our petty, self-conscious concerns.She has made two artist books, so far, and I’m curious to read them. I bet they have wisdom. I’m going to try to track them down, but meanwhile, life is moving through our window all the time. Don’t miss it! I think Hannah’s going to do just fine around here.